This large lightweight paper/fabric (it has the texture, thickness, and feel of a paper towel) bag has 2 snaps at the top (only visible in the front) and a 35 3/4" by 3 5/8" shoulder strap. 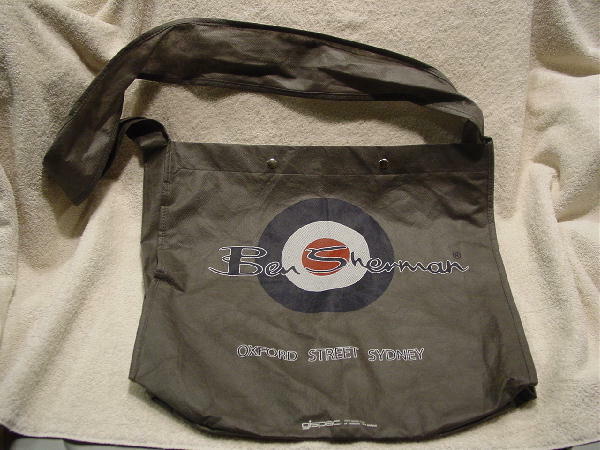 The front and back have the same design - Ben Sherman in black letters outlined in white on a red, white, and black bullseye, and Oxford Street Sydney in black and white letters. 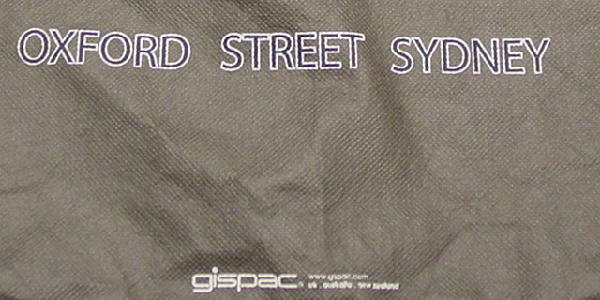 gispac www.gispac.com UK Australia New Zealand is on the bottom front in white letters, but not on the back. The background is in a taupe with a touch of dark gray and olive color. Eden got it when she was modeling in Australia.